Hugo has been in the world for seven whole weeks now and he is changing some much. Previously he would often just sleep and wake for feeds without needing much in the line of stimulation. As he is getting older though those periods between sleep are becoming longer and he requires a level of entertainment. It’s hard with a baby though as they don’t really grasp the concept of toys for a few more months so how was I going to encourage Hugo’s curiosity and stimulate his mind? 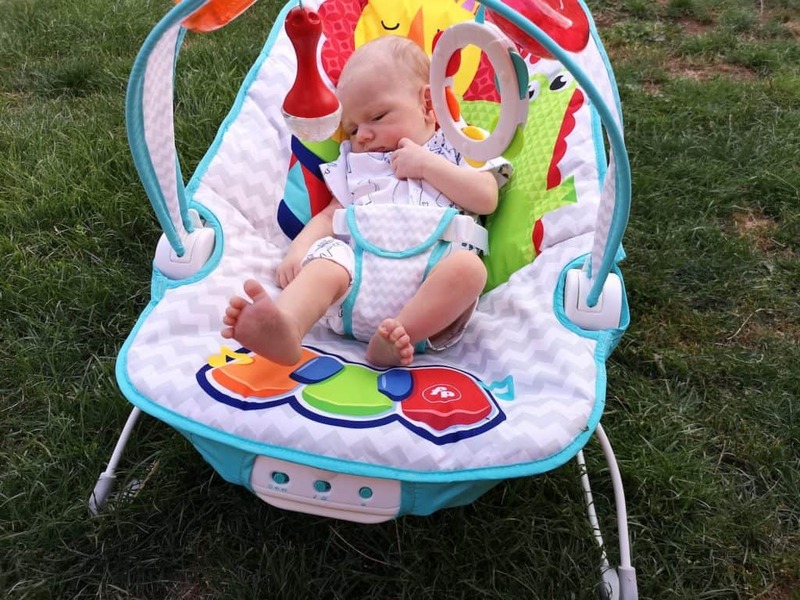 We have recently been testing out the Fisher-Price Kick ‘n’ Play Musical Bouncer which seems to be doing just the trick. The Fisher-Price Kick ‘n’ Play Musical Bouncer is suitable from birth onwards and has an RRP of £57.99. 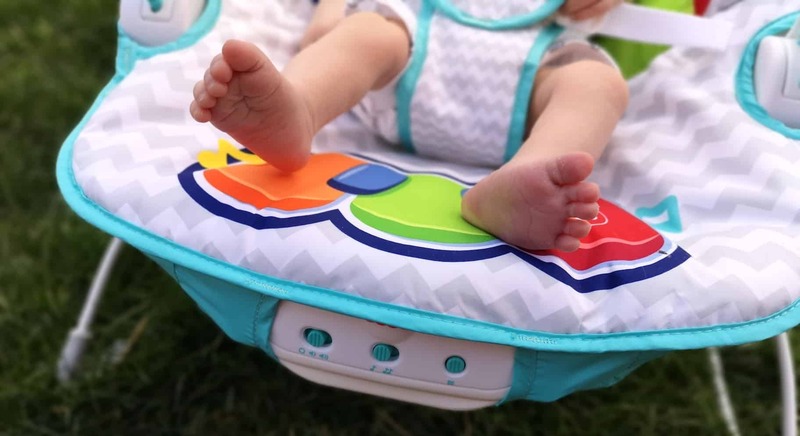 It is essentially a moveable baby chair with some age appropriate features to help keep them entertained. 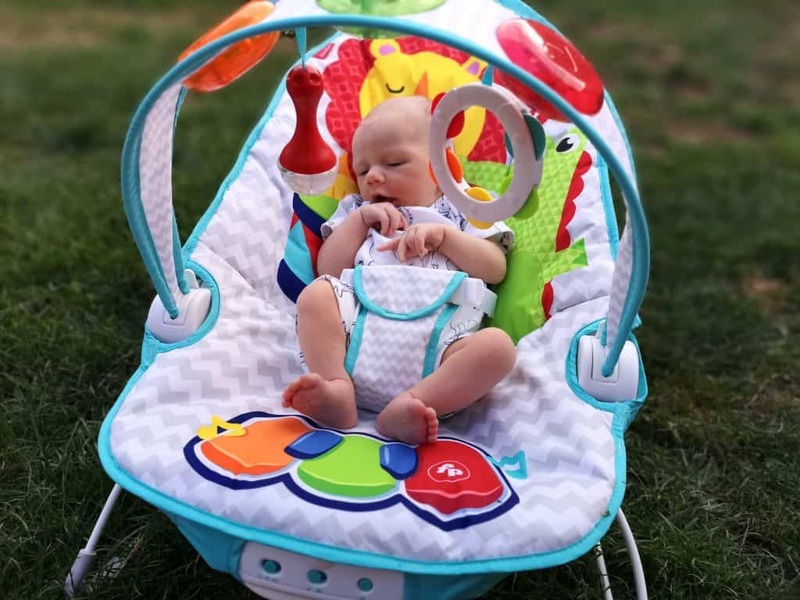 The bouncer has a calming vibration that helps settle and calm baby whilst also having two musical settings. You simply sit the baby in the bouncer and attach the three-point harness giving you as a parent a welcomed break from holding or carrying the baby. The bouncer requires assembly and batteries (3 x D – not included) before use. If I’m honest, putting the bouncer together wasn’t as simple as I would have liked. Although it pains me to admit it I had to enlist the help of my husband and it took around 25 minutes and a screwdriver! Due to the shape storage of the bouncer could be a pain. We use the bouncer daily so it just sits in the corner of the room until we need it so isn’t a problem for us. I liked how the Fisher-Price Kick ‘n’ Play Musical Bouncer helps stimulate Hugo visually and with the use of sound. When he kicks his feet on the piano keys it triggers the music and the lights which makes it both entertaining and interactive. I also like the vibration function as it has really helped relax Hugo particularly as he has had some colic issues lately and struggled to settle unless in someone’s arms. I found that he would almost instantly calm down whilst in the bouncer which gave me a welcomed break. Having the three-point harness means that I have peace of mind that Hugo is secure whilst using the bouncer and means I don’t have to constantly hold him whilst he is using it. There are two musical settings on the bouncer both a short and long play option. In short play, each piano key plays a note and the corresponding light on the activity bar illuminates. In long play music will play whilst the lights on the activity bar flash in time to the beat. There is also a volume control so you can have the music louder or quieter depending on the setting. I also liked that the activity bar was removable and the seat pad is machine washable. 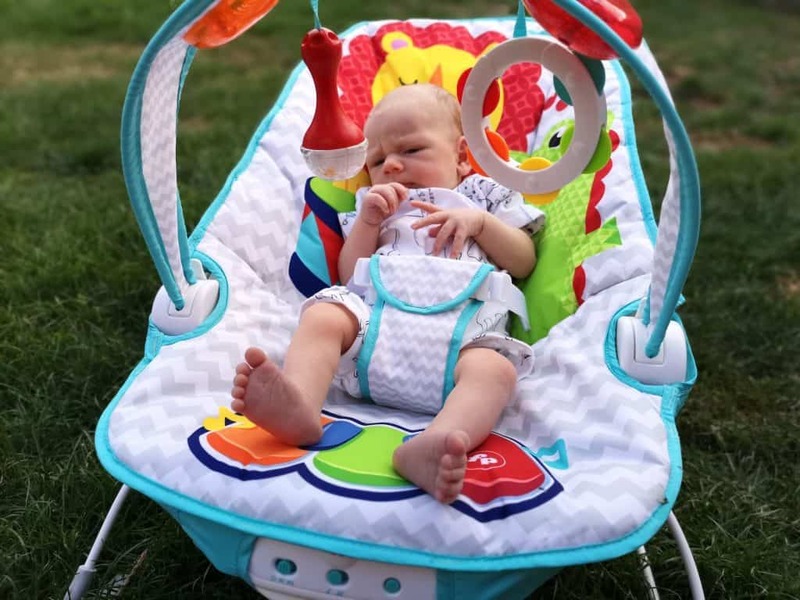 I’m really impressed with the Fisher-Price Kick ‘n’ Play Musical Bouncer and would absolutely recommend it. I think it will be a staple item we use constantly over the next few months. You can purchase your own Fisher-Price Bouncer from Argos. Bouncers are so fab! I love the piano keys to help stimulate babies. It also looks a good size although hard to tell from the photos since he is only 7 weeks old. I love a bouncer! They’re a saver! This one looks great I definitely would have got it for Oscar had it been around then.